The nasty party is back. The ConservativeHome's new poster spoof website exchanges humour for bile. After three rounds of Tory poster spoofs, ConservativeHome have today launched their own spoof website of a spoof website of Conservative posters. Confused? They seem to be, exchanging humour with bile, mocking anyone on benefits as being scroungers and suggesting that the Labour government is on the side of burglars. 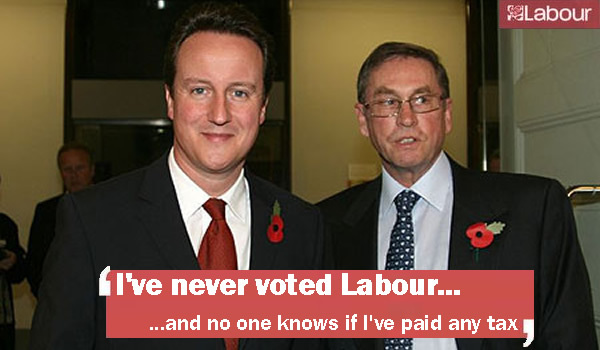 You can take a look for yourself at the new site, ‘I’ve never voted Labour before‘. But even a spoof of a spoof can be spoofed. Will (and Jess) – the problem is that this Labour government has spent most of the past thirteen years cracking down on benefit fraud rather than tax avoidance! How hypocritical can you be?? Oh it’s down to context! Rubbish! How come they are funny when aimed at the Tories but not so when aimed at Labour? This is the sort of hypocrisy I thought (hoped) Labour had started getting rid of. Looks like I was wrong. Or is it okay as long as you are Labour? Oh and my money’s on you not posting this! GetLabourOut – You’re very welcome here. We welcome dissent, just not abuse and you’re a polite Tory by the looks of things! Mehdi – Labour certainly hasn’t done enough on tax avoidance, I agree, but it has made some efforts including the requirement for firms to report any new tax avoidance schemes they invent. And it would be wrong to ignore benefit fraud altogether. A fair tax and benefits system means fair on cheats at both ends of the income spectrum. Some time likely 13 years. And remarkable that there is any prospect of international co-operation on the matter. The PM’s leadership of the G20 was not without its effects, despite the wishes of the various anti HMG groups here. I think I’d ask the foreign based billionaires for their opinions . . . ooops . . . . their donations already answer that one. Sir Richard seems to have had enough too . . .
Do you not recogise that there could be a the difference between benfit fraud which is a crime of the claimant and benefit trap which is a crime of the state. Creating a situation which infantalises people by making it unrealistic for them to seek to be self reliant by making any efforts on their own part very unlikley to ever improve their lot; leaving them with “this is how it is” lives, free of hope or aspiration – in that situation benefit dependency is the only rational step. It costs us all a fortune, (many times benefit fraud I am sure), but for those who find themselves in that situation, it costs them much much more. The poster spoofs are just tapping into the views of the country. We now find there are 8.08 million economically inactive people in the UK – that is 21% of the working age population and that is a disgrace!! Given the additional massive increase in government employees, it seems that there is just one bloke called Dave working in a garage in Stevenage who is left alone as the token person operating within the commercial part of the UK economy. Labour’s policies are to just keep on taxing Dave more and more, whilst giving away money to the rest of the country. Is it really any wonder why so many people hate Labour!? At the risk of disloyalty, I have to say, you’re right. Some of the spoof Cameron posters were funny; I’ve yet to see a spoof Labour Party poster than makes me do anything other than cringe. Hopefully, by satirizing to the Cameron posters, you’ve added a few to the Tory vote. Evidence-based blogging: Since June 2007, Gordon Brown and Will’s dad have given 7,000 burglars early release (http://www.justice.gov.uk/publications/docs/ecl-releases-recalls-december-2009.xls). No, they suggest that the benefits scroungers will continue voting Labour because they don’t want to lose all their benefits and (gasp) have to get a job (if the tories don’t make everybody redundant, that is) Note how Frank Gallagher from “shameless” is on the poster? It’s a bit of a clue, guys. And even if they ARE suggesting Labour are soft on criminals, even to the point of being “on their side” how is that “bile”? How many times have you heard of criminals being released when they shouldn’t be and then going on to commit more crimes? As far as I can see, it’s pretty damn accurate. The anti-cameron posters were far better-looking, and funnier, but if you can’t take it, don’t dish it out! i love it! its worth a try though. Cameron and Osbourne have never had any governmental responsibilities and their inexperience makes them unsuitable for the job. please together make up a list of requirements we want from a leader and see how many boxes you can tick for Cameron lol. Yay!!!! ….Nasty Party is back!!!! All is well with the world!!!! Let Nastiness Rule!!! …. we love it!! !